The BSK5 Brain Slice Keeper has been designed to pre-incubate a large number of brain slices prior to transfer into recording chambers. Based on the BSK4, it consists of two (BSK5-2) or four (BSK5-4) closely fitting acrylic rings, located in a half cylinder manifold. The close fitting rings allow a removable sheet of nylon netting to be wedged and held in place. 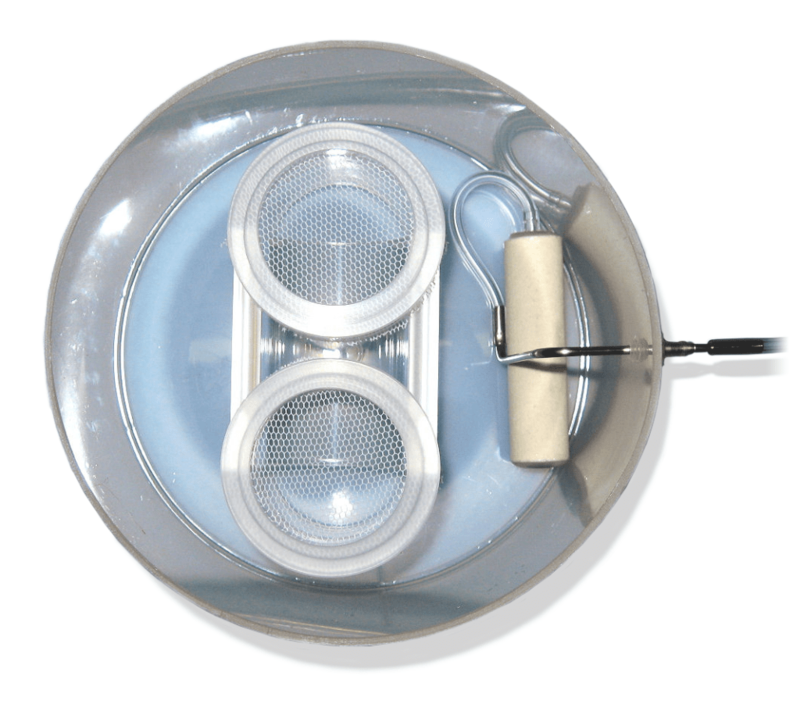 In this slice keeper, the slices are maintained at an interface between the incubation medium and a humidified, high oxygen atmosphere within the holding vessel. Furthermore the slices can be maintained on a flat porous membrane attached to the nylon netting in order to maintain the underside of slices perfectly flat for subsequent experiments utilizing microscope techniques. In operation, the manifolds carrying two rings each are located in the base of the holding vessel and are partially immersed with ACSF by filling to the level of the netting. The purpose- designed holding vessel is supplied with a 95% O2, 5% CO2 gas mixture via a ceramic bubbler. The ceramic bubbler is located to the side or in a central space between the two manifolds when a four ring version is used. The bubbles rising from the base saturate the ACSF and provide constant circulation of medium to the slices from the underside. Typically slices are placed on lens tissue which rests on the nylon nets or optionally on porous membrane discs attached to the netting. Bubbles are prevented from rising and being trapped under the slices by the half cylinder deflector, thereby ensuring a continuous circulation of medium. Slices remain viable for many hours in these conditions. The BSK5 together with the holding vessel can be easily placed into a water bath for profile ensures that condensation drops do not fall directly on top of the slices. The typical fluid volume with BSK5-2 is around 250ml and reduced further with in BSK5-4 where two manifolds are utilized. BSK5-2 viewed from above. Brain slice keeper with rings and net in place and with lid in place (inset). An included needle valve is used to control the flow of oxygen mixture to the ceramic bubbler. A BSK5-4 contains a total of four rings.